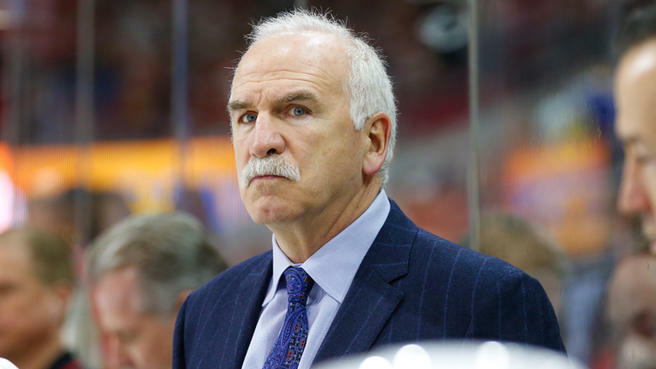 Early on Tuesday morning, members of the Chicago Blackhawks got word that their head coach, Joel Quenneville, would no longer be standing behind them. It seemed to shock them as much as it shocked the hockey world. “When I first heard the news I’m just kind of thinking I wish I wasn’t sick in Vancouver or I wish I maybe felt better on the road trip,” said Kane, when asked about the sudden change. Those aren’t the words of someone who saw a change coming. Quenneville, the second best coach in NHL history when judged by wins, led the team for ten seasons, taking them to the playoffs in nine. By now, you probably already know that the current woes of the Chicago Blackhawks fall mostly on poor managing decisions, dating all the back to the original architect of the Hawks glory days, Dale Talon. This current Chicago roster is simply too slow and lacks the talent needed to compete in the modern NHL. Now they will be facing the lion’s share of the season without a decade’s worth of leadership. At the helm will be Jeremy Colliton, a talented, but inexperienced coach who only has one full year of North American pro head coaching experience under his belt. Chicago’s Central rivals have to be smacking their lips in anticipation. None more perhaps than the club coming to town on November 14th. The St. Louis Blues gave Mike Yeo three years, plus that weird apprenticeship under Ken Hitchcock to allow him to make the team in his own image. The fruits of that experiment, though talented, have massively underperformed in almost every aspect of the game thus far. The Blues seem rudderless and Mike Yeo clearly is not the answer. Inadvertently, the Chicago Blackhawks might have gifted the Blues a life preserver. What the St. Louis Blues need someone with a bit of swagger, someone who knows how to work with veteran talent without stunting younger players. The Blues need someone who can organize their defense and utilize the offensive tools currently on the roster. All those boxes check for Quenneville, who spent the first eight seasons of his head coaching career in St. Louis. There have been some slights on Q’s coaching style over the years. Some have pointed to an unwillingness to change with the times in his strategy. I think that’s a bit unfair, considering he was just fired from a team which managed to be both very young and very slow. I think he did the best he could with the roster he was given. The hybrid mix of possession with a purposeful speed he tried to employ during the start of the Blackhawks season would fit the roster he could inherit in St. Louis. If Doug Armstrong and the Blues front office have any sense at all, they should be setting up a meeting with Joel Quenneville today. This season might already be too far gone for a redemption arc but if there is any coach able to pull a team to their full potential, it’s the man who did just that in 2008 for the Chicago Blackhawks. Joel Quenneville took over for Denis Savard after just five games that season. That team made it to the Western Conference Finals. Could something similar happen for the Blues? Perhaps it can. The Blues current situation is untenable, and there is a proven hall of fame caliber name, intimately familiar with the franchise who suddenly has a whole lot of time on his hands. Perhaps Joel Quenneville can pull the Blues out of the fire. November 14th would be an excellent time to begin to find out.